Compassion started working in Tanzania in 1999. Today, there are over 85,000 children registered in our programs through 387 church partners. Dear Sponsor, Greetings in the name of Jesus. I am Agnes Hotay; I have been the Country Director of Compassion Tanzania for the last three years, but I joined the ministry 14 years ago. I have been married for 15 years and my husband and I are blessed with three children: Hannah (13), Joshua (10), and Caleb (5). My best moments are during praising and worshiping God. I love singing, especially leading worship songs. 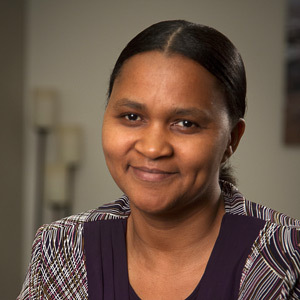 I am Agnes Hotay; I have been the Country Director of Compassion Tanzania for the last three years, but I joined the ministry 14 years ago. I have been married for 15 years and my husband and I are blessed with three children: Hannah (13), Joshua (10), and Caleb (5). My best moments are during praising and worshiping God. I love singing, especially leading worship songs. Compassion has worked in Tanzania since 1999 and we have 388 Compassion projects where 85,000 children and youth receive support. Tanzania has 947,303 square kilometres with 30 administrative regions, out of which Compassion ministry operates in 16 regions, in partnership with 21 different evangelical denominations. I want to take this opportunity to specifically thank you for your partnership with us. Your kind support, love and care for your sponsored child have made a big difference. Because of your ministry, your child is connected to the church and has the opportunity to meet people who extend love and care. Your child has the opportunity to hear the Word of God and receives meaningful biblical teachings at least once in a week. Your sponsored child is also provided with the opportunity to attend school with necessary schooling materials and receives appropriate treatment whenever sick. Not only that but also the child is able to build health relationships with peers and enjoys other social activities facilitated by the church. I am a witness of what sponsorship does in the lives of our children. Children feel cared for and loved, as they have a safe place to go, they have people who listen and protect them. They learn about the love of God and how they can share the same to others. Apart from normal schooling, they have opportunity to receive other trainings at the project. Our churches have structured lessons for different age categories, which are delivered by the loving and caring church workers and volunteers. Children are provided with opportunity to learn at least one livelihood skill as a means for self-supporting initiatives in the future. Our children and families face various obstacles in their daily lives; our nation struggles with the quality of education, as public schools face major challenges of poor infrastructure and insufficient numbers of teachers. The government efforts to provide better health services to all citizens are not without challenges. We still have few, ill-equipped public health centres. Unhealthy cultural practices, such as early marriages for girls, female circumcision and albino killings, pose critical challenges to the welfare of children in our nation. I personally appreciate the government’s efforts to address these issues, and we understand it takes time to deal with such culturally rooted practices. My vision for the ministry in the coming year is to see that we support our church partners to have stronger programs on discipleship, livelihood skills and youth engagement. The teenagers in our program just as in our own homes face different challenges that need special attention and greater innovation in our programs. I strongly believe in God’s provision and guidance on this, and through your support we shall make it. In a recent youth graduation, two young ladies among the graduates moved many people into tears. During registration, the parents of one of the ladies had a difficult moment to choose between her and her young brother to enter the program. Finally, she was the lucky one and this was because she had a serious illness and her parents had no hope for treatment. “I have so many friends here today who carried me to the project because I could not walk in my early years; after I was registered into the project, I went through six surgeries on my two legs to be able to walk. This would never have happened without the help of Compassion,” she said. She also added that she is pursuing studies in medicine and she is determined to become a sponsor when she finishes her studies and secures a job. With tears flowing, the second girl shared how both her parents died within three years upon her enrolment into the program. “My two siblings and I were left alone with no one to look up to. Two of us were registered in different projects. What sustained us was the teaching about depending on God and the close attention and care that we received from the project. I want to sponsor children when I get a job,” she said. The churches have great opportunity to reach their surrounding communities with the gospel as they visit the children and families. Churches have different outreach programs, others have initiated social services such as nursery schools; support during disasters such as floods, droughts and others; special programs for HIV/AIDS affected people, widows and orphans. Apart from daily support for children at the project, the other valued component is the relationship between the child and the sponsor. The relationship grows stronger and stronger as they exchange letters. Children glow with excitement upon receipt of the letters from their sponsors. They feel more valued and loved. One example is a child who did not want to attend school almost dropped out, but then he received a letter from his sponsor, asking him about how he was doing in his studies. He felt that he was going to disappoint his sponsor and decided to go back to school. Please be assured that a letter for your sponsored child is a big source of encouragement not only for the child but for the family too. Sponsor letters are often kept as special treasures by children and their families. In a small mud-thatched house, they will keep the letters in a plastic bag to ensure the letter are not spoiled. I request you to spare a moment whenever possible to write a letter to your sponsored child, even if it is just a few sentences. The few words of encouragement will be so meaningful and life changing. Some children come from families with difficulties such as broken marriages and hostile environment. Phrases like ‘you are beautiful’, ‘you are smart’, ‘you are clever’ are rarely heard in their ears or no one has ever told them that they are loved. A letter with such words will make a lasting impact. I want you to know that I pray for you whenever I can. I also understand that your support comes as a gift from God to us and it comes from a sacrificial heart. Thank you for joining hands with us. Please join me to pray for our nation to have better quality education and health services; also, pray that our church partners will continue to be innovative and create more youth-friendly programs. Ombaja never met his father, who died before he was born. When he was just two years old, his mother died, and he has no memory of her, either. 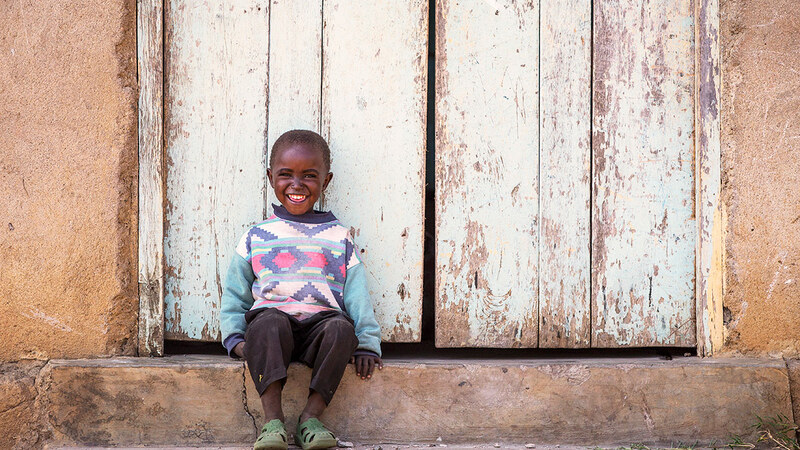 Like other orphaned children in his village, he was left to live with his grandmother. His future looked dire. But after a few years, his grandmother was struggling to care for him and his uncle, Mathube, decided to take Ombaja with him to town. He wanted to help Ombaja get an education, alongside his own children. When he arrived in Shirati town, Mathube learned about Compassion through the church and asked if his nephew could be registered. From that day, Ombaja’s life was never the same. He was able to start attending school with new books and a uniform, thanks to his participation in the program. Then, two years later, his sponsor sent him a small financial gift. “Ombaja started receiving gifts from his sponsor in 2011. He was asked what he wanted to do with his money and he indicated that he wanted to use the money to buy cows. I think this is because most of the people here keep cows,” says Bulima, a local program worker. 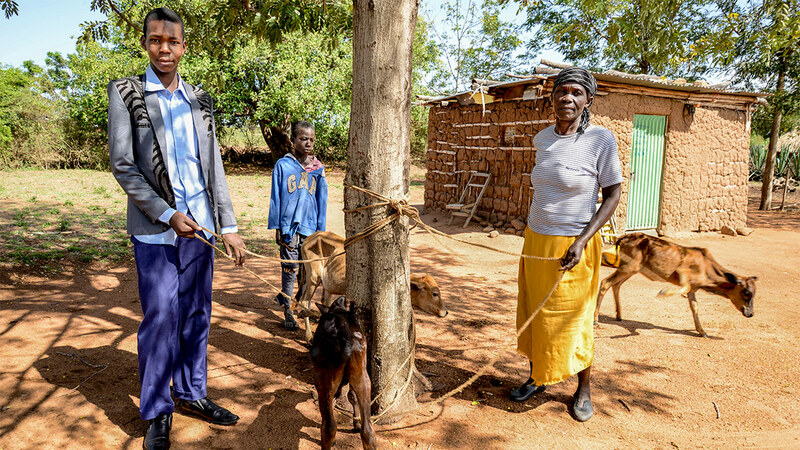 Ombaja’s sponsor had sent him 168,000 Tanzanian shillings (about US$75), which in his community was enough to buy one cow and two goats. After a few months, the goats reproduced and the young boy and his uncle exchanged them for a cow. Gradually, by again using his sponsor’s gifts to buy cattle, he built up a small herd. Meanwhile, Ombaja was thriving at school. After he completed Grade Seven, he earned a good score that qualified him to attend a government school. With the advice of his uncle, he sold some of his cows and used the money to join Komu Secondary School. 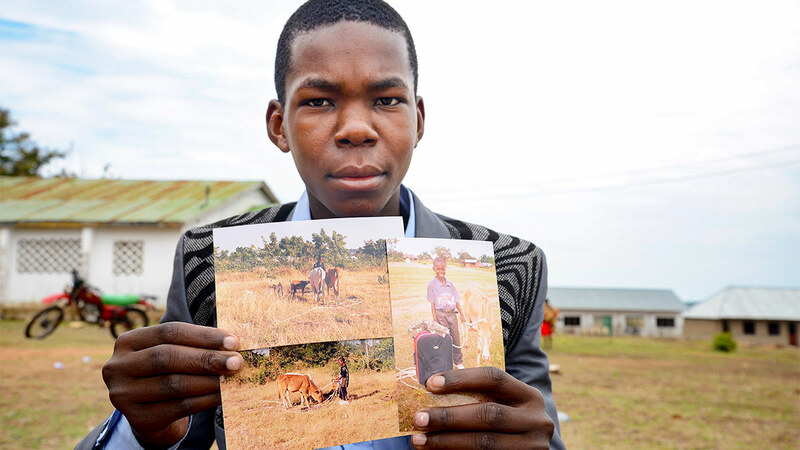 Now almost 15 years old, Ombaja is confident that his life is anchored on a solid rock and that he can dream about the future, despite losing both parents at a tender age. Thank God for the screening and registration that was done in April and all the new child development centres that launched. Pray that they will quickly establish themselves as places of learning, safety and support for the children and their families. 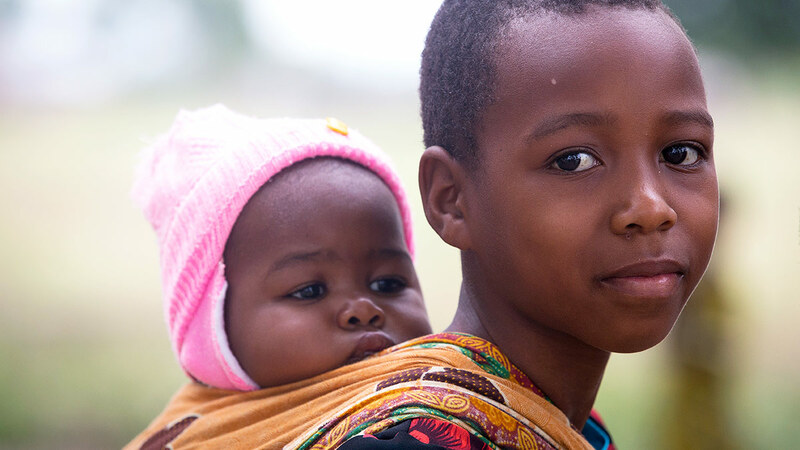 Pray that the partnerships between the local churches and Compassion Tanzania will be long and fruitful. Pray for the bereaved parents and families who lost their loved ones, 32 primary school pupils, two teachers and one driver, who died in Arusha through a minibus accident when they were travelling to a neighbouring school in Karatu town for a joint-schools examination. Pray for God’s peace and comfort to be on those families, and for the local church to provide much-needed support. Please pray for Compassion staff as they travel to different places in the country for facilitation and other ministry assignments, especially for partnership facilitators who travel a lot, that God may protect and keep them safe, especially against road accidents during this heavy rain season. Please pray for Form Six students who have recently completed their examinations; ask that God will be with them as they wait for results and placement for further education. Being born with albinism in Africa can be dangerous. Thought to possess magical powers, people with albinism have been hunted and killed for their body parts. This is Grace’s story.